Express Subnet Mask In Slash Notation: We can express the subnet mask 255.255.248.0 as /21, since it is 21 ones followed by 11 zeroes. In other words, its prefix length is 21. Now, what could be easier than that? Well, you could simply refer to the subnetting summary tables. 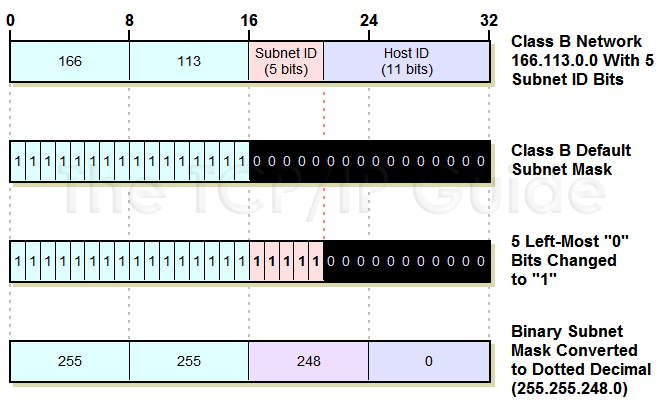 Find the table for the appropriate class, and then find the row that you selected in the previous step that matches the number of subnet ID bits you want to use. You can see the matching subnet mask right there.